On April 9, 1940, Germany invaded Denmark, overrunning the tiny coun­try in less than a day. The Danish govern­ment and king remained in place, collab­o­rating as little as pos­sible with the enemy. In an effort to create a “model pro­tec­torate” out of Den­mark, the occu­pa­tion author­ities in­i­tially inter­fered as little as pos­sible in Danish govern­ance, policing, and the legal system, even in the face of growing dis­con­tent among Danes over black­outs, short­ages of goods, and rationing. In mid-1942 the banned Com­mu­nist Party set up sabo­teur groups that carried out sabo­tage using home­made fire bombs—all they had at the mo­ment in their wea­pons arse­nal. Mem­bers were mostly Spanish Civil War (1936–1939) vet­er­ans who had fought against Gen. Fran­cisco Franco and his Axis sup­porters. 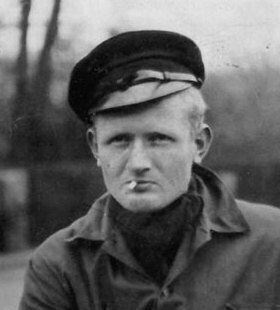 Other resis­tance groups included Holger Danske, formed in Copen­hagen in 1942 by vet­er­an volun­teers who had fought on the Fin­nish side against the Soviet Union during the Win­ter War (Novem­ber 1939 to March 1940); the tiny Hvidsten group, started in 1943 but stub­bed out in 1944 when its mem­bers were arrested by the Gestapo; and the Borger­lige Parti­saner (“Civic Parti­sans”), or BOPA, started in early 1943 by a students who had been ex­cluded from the KOPA (Kom­mu­nistiske Parti­saner, “Com­munist Parti­sans”). On this date in 1943 the largest resis­tance organ­i­za­tions—the Com­mu­nists, Dansk Sam­ling, Frit Dan­mark, and Ringen—formed a joint Free­dom Coun­cil (Friheds­rådet). The Coun­cil aimed to not only coor­di­nate the hither­to scattered resis­tance ini­ti­atives, but to plan for what Den­mark was going to become after the war. Through its con­tact with the London-based SOE (Special Opera­tions Exec­u­tive), the Free­dom Council came to repre­sent the entire Danish resis­tance move­ment vis-à-vis the Allies. 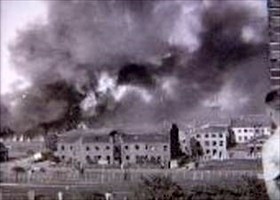 Following the Copen­hagen strike of June and July 1944, and espe­cially after the start of the German po­grom against Danish Jews at the end of Septem­ber 1944, the leaders of the Ger­man-sanc­tioned Danish polit­i­cal parties felt com­pelled to enter into a com­pro­mise with the Coun­cil. The Danish state even chan­neled money to the resis­tance by way of its Social Minis­try. Coop­era­tion with­in the Council and the com­pro­mise with Danish politi­cians en­sured an al­most non­violent tran­sition from occupation to postwar peace in 1945. Left: Partial membership on the Danish Freedom Council (Friheds­rådet), Den­mark’s unoffi­cial in-country govern­ment-in-exile. 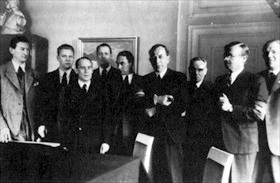 Created in Septem­ber 1943, the Danish Free­dom Coun­cil attempted to unify the many dif­fer­ent groups that made up the Danish resis­tance move­ment (Modstands­bevægelsen). It was made up of seven resis­tance repre­sen­ta­tives and one mem­ber of the British Special Opera­tions Exe­cu­tive (SOE), which was engaged in making air­drops of agents and sup­plies. The resis­tance move­ment grew to over 20,000 mem­bers, and in the lead-up to D-Day (June 6, 1944) acts of sabotage markedly increased. Right: BOPA (BOrgerlige PArtisaner, or Civic Parti­sans) mem­bers in a truck. Due to the unu­su­ally lenient terms given to Den­mark by the Nazi occu­pa­tion author­ities (Den­mark was not offi­cially at war with Ger­many), the Danish resis­tance move­ment was slower to develop effec­tive tactics on a wide scale than in some other occu­pied coun­tries. However, by 1943 many Danes were in­volved in under­ground activi­ties ranging from pro­ducing illegal publi­ca­tions to spying, bomb making, and sabotage. Right: Copenhagen arms factory (Dansk Riffel­syndikatet) sabo­taged by BOPA on June 22, 1944. 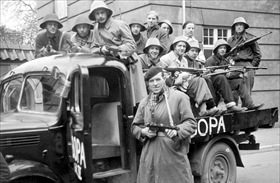 The fac­tory in Copen­hagen’s Fri­haven was the only Danish fac­tory making small arms, anti-tank guns, and artil­lery. 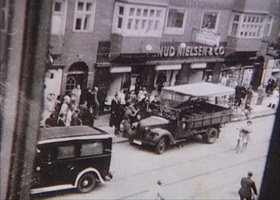 Thou­sands of Copen­hageners watched the buildings burn down to an empty shell. By the end of the war the Danish resis­tance move­ment had scored many suc­cesses, losing slightly more than 850 resis­tance mem­bers killed in action, in prison, in con­cen­tra­tion camps, or (in the case of 102 resis­tance members) exe­cuted following a court-martial. Above: In spring 1944 members of the Holger Danske group were arrested and sen­tenced to long prison terms or sen­tenced to death. Sixty-four mem­bers were exe­cuted by the Gestapo, which twice suc­ceeded in infil­trating the organi­za­tion. Holger Danske had a small liquida­tion cell that took care of more than 200 in­formers. Two of the most active Holger Danske mem­bers were Jørgen Haagen Schmith (1910–1944), left photo, and Bent Faurschou-Hviid (1921–1944), both famous under their aliases, Citronen (Lemon) and Flammen (Flame). 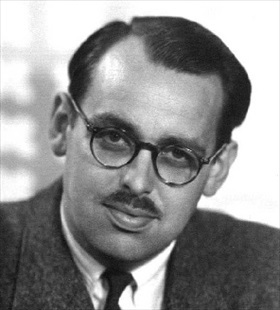 No resis­tance mem­ber was more hated or sought by the Gestapo as was the red-haired Faurschou-Hviid. The Danish film Flame & Citron (2008), a fiction­alized account of Faurschou-Hviid and Schmith, was a huge box-office success.